Chicago in the late 1880s was a city on the rise, economically, socially and vertically as the first wave of skyscrapers were built; a maelstrom of mobility and enterprise as the city exploded in population. With a sizeable chip on its shoulder, the city was looking for a way to put itself on a par with New York and onto the global map. The solution was to bid for the 1893 World’s Fair, the most recent of which had been held in Paris, but to build bigger and better, to attract a larger audience, and to out Eiffel the Eiffel Tower. To oversee its development the city put local architect Daniel H. Burnham in charge, with a brief to build a fair like no other and to do it in record time. Burnham set about his task with gusto, despite the death of his partner near the start of the project, political interference, and the reluctance of others to contribute with the same enthusiasm. Near to the park another enterprising man had set up business, first purchasing a pharmacy, then developing a block into shops and boarding rooms with large vault and furnace in the basement. It was the perfect location to stay for those visiting or working in the park. Dr H.H. Holmes was a charming, charismatic conman and womaniser who seduced a succession of women to their death, as well as murdering a number of children and men. His total number of victims is unknown, but thought to be well over thirty. 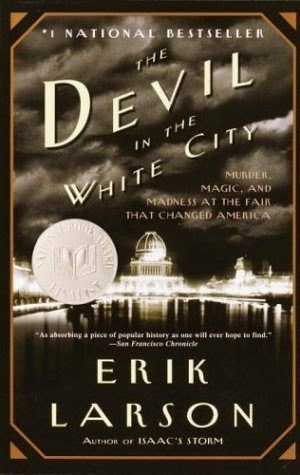 In The Devil and the White City Larson tells the stories of the two men and the events that consumed them both as a means to tell the wider story of the World Fair and Chicago’s development. 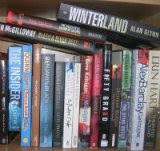 It’s a strategy that works remarkably well, with both narratives full of drama, intrigue and suspense. Indeed, Larson manages to balance well the details of each man’s life with the wider context of the fair, the swirl of other actors, city politics and social landscape to provide an interesting and engaging historical account. This is to be admired, I think, because the book could have been a rather dull, dry, fact laden tale, whereas Larson understands the notion of popular history, writing almost in the style of a fictional account. If you’re visiting Chicago and you’re looking for an entertaining and informative read, then the book makes for a good travelling companion. Yes, I think he taught us something about how to write exciting history. I think you've nailed it. Larson's balance is the key. Great review!